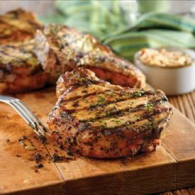 This delicious pork chops recipe is different than most I have seen in the past. What is really great about it is that it's easy to prepare and makes a great tasting dinner that the entire family can enjoy. This recipe makes 4-6 servings. The bottom recipe is the one you will need to make for the marinade. 1.Remove pork chops from marinade and pat dry with a towel, apply salt and pepper both sides. 2.Heat grill on medium high heat. Once the grill is ready, place the pork chops flat on a 45 degree angle and cook for 2 minutes. 3.For perfect grill marks, lift the pork chop and rotate to the opposite angle (think of a clock- start facing 2 and then you rotate the pork chop to face 10). Cook for 2 more minutes. 4.Flip the pork chop to the other side, turn the heat to medium, and repeat step 3. 5.Grill until cooked through, or until instant read thermometer reads 145 degrees internally. 6.Rest 3 minutes, top with chutney and serve. 1.Place all ingredients in a blender and pulse until mixture is smooth (approximately 30 seconds). 2.For best results: marinade your desired meat at least 10 hours or overnight. Disclosure: The photos & recipes are courtesy of Sparkling ICE.